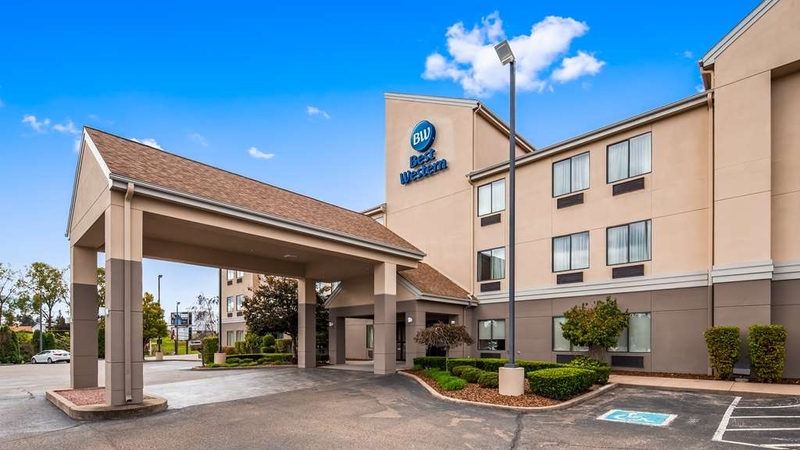 El Best Western B. R. Guest se encuentra en el centro de Zanesville. Venga y disfrute de las mejores atracciónes turísticas cerca de nuestro hotel. Precios bajos garantizados y ofertas exclusivas. Escoja este hotel de Zanesville, Ohio, en el que los huéspedes podrán encontrar un servicio de atención al cliente de primera clase y un cómodo acceso al aeropuerto municipal de Zanesville. Bienvenido al Best Western® B. R. Guest, un hotel de servicio completo donde los huéspedes se sentirán como en casa. Ubicado junto a la carretera interestatal 70 en la zona central de Ohio, este hotel que admite mascotas goza de una cómoda ubicación junto a una gran variedad de empresas cercanas entre las que se incluyen 5B's Factory, Plaskolite, Avon Distribution Center y Zanesville Aviation. Los huéspedes que se alojen en este hotel del área de Zanesville también encontrarán unas habitaciones magníficamente equipadas con televisor con pantalla plana con canales vía satélite con HBO® y acceso a Internet de alta velocidad. El Best Western® B. R. Guest ofrece todas las instalaciones y servicios que los huéspedes pueden esperar de la marca BEST WESTERN. Entre los servicios e instalaciones de nuestro hotel se incluyen un desayuno gratuito con bolsas para llevar de lunes a viernes, una piscina cubierta y un centro deportivo. Entre los servicios adicionales se incluye un centro de negocios de servicio completo y agua embotellada gratuita a la llegada. Los huéspedes que se alojen en este hotel de Ohio podrán realizar una visita al Museo Zane Grey, situado a sólo 6,5 kilómetros o visitar The Wilds, un parque al aire libre de conservación de fauna. El Best Western® B. R. Los huéspedes también estarán situados cerca de una gran variedad de tiendas en el centro comercial de tiendas directas de fábrica de artesanía de Zanesville, Longaberger® Company y White Plains Christmas House. Otras atracciones cercanas incluyen Touch of Thread Quilt Gallery, la Universidad Estatal Zane y el recinto ferial del condado de Muskingum. Los huéspedes del hotel podrán disfrutar de eventos como el Festival Anual de Artesanía y el Festival Gus Macker. El personal cordial y atento del Best Western® B. R. Guest está listo para asegurarle una estancia inolvidable en Zanesville. ¡Haga su reserva hoy mismo y ahorre! I did not enjoy my stay. The walls are paper thin. While in my room I could hear conversations from people in another room. On the one side of our room was a mechanical room. It was so loud that I could not sleep. In the middle of the night a Fire Siren went off outside that sounded like a tornado warning. We were not aware of what a fire siren was and were fearful. The front desk woman on our second night was unfriendly and mean. After my interactions with her I decided that I would never stay at this hotel again. "Most Staff Sucked Along with manager"
Went to the desk to ask a simple question and the clerk was beyond rude. Left her know that I would be taking the issue of her rudeness up with the manager at which point she just looked at me and rolled her eyes. So the next day I brought the issue up with the manager with no help from her and she was rude as well. The guy on night shift point blank said to me that he flat out does not like the employees for the company I work for. He was also watching a movie in the lobby and the all I heard was F***this and F*** that. Very unprofessional. I also came back from work one evening and my bathroom had been used and there were used make up remover pads laying on my bathroom vanity. There was one employee that worked over night shift and SHE was very friendly and helpful. She should be made manager as the current manager obviously does not care about what goes on at that hotel. Being as my wife has been in the hotel industry for many many years and was actually management for choice hotels she will now be taking this matter up with corporate. The staff is always very freindly and helpful. 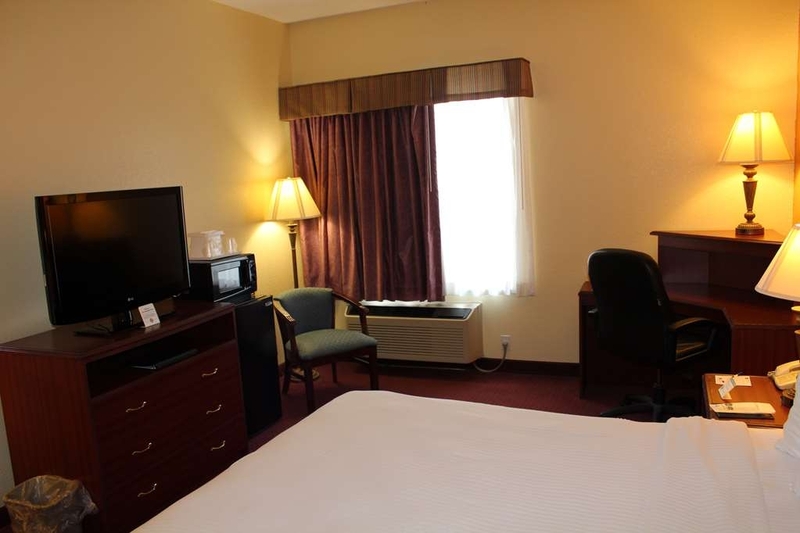 The rooms are clean and the beds are comfortable.My stay is always relaxing and Quiet. They also have pletty of restraunts within walking or few miles. Also the price is right. "Very Nice BW - Pet Friendly"
Very nice hotel, convenient off the highway. Staff was very friendly and helpful. Nice pool and good breakfast! Only concern is that the third floor is reserved for pets and half of it is also smoking rooms. Sometimes smoke odor was in the hallways. "Yeah nice place and good for hunters"
After a long day of working its great to get to the hotel and be welcomed by a kind saff and to take a hot shower and relax in a clean and safe room. Beds are very comfortable as well as the pillows. The rooms are Quiet and I sleep GREAT. During the elevator shut down there was no warning from the desk. The staff was vacant during the entire 1/2 hr. i waited in the lobby and never once made an explanation to arriving or departing guest as to handle this event. I need 2 canes to walk, so moving luggage from our 3rd floor room down the fire stairwell was difficult. Had we had a phone warning we would have gotten up at an earlier time.We stayed at Best Western during the past 8 years and this is not what we expect. Toilet and shower separate from one another. Small sink area - not much room for personal items. Small breakfast area. Asphalt road leading into the motel lot is in need of serious repair. Most restaurants are 3 miles west of this location. the group had a great time. the hotel was very good about all the bikes (approx. 85ish) and letting us "hang out" in the parking lot during the evening. the staff was very friendly. the pool was very refreshing although it needed to be a little "spruced" up. We stopped after a long day and found a very friendly and helpful staff person to check us in. Our room was small but clean with good AC. The bed was a bit soft but the room was quiet. The shower was good except there was no bath mat which made showering a bit iffy. Breakfast choices were varied enough to appeal to many people. I do not hesitate to recommend this hotel. "This is a smoking property "
Outside of traveling to Las Vegas you really don't expect to find properties that still allow smoking in the rooms but this one does. If you are a smoker this is perfect for you! If you are bothered by the smell of cigarette smoke , suffer from allergies or have asthma this is not the place for you. They only have s handful of smoking rooms but just like it's impossible to have a smoking section in a restaurant the smell permeates this entire hotel. The pet rooms are on the same floor as the smoking rooms and I was choking from smoke in the hallways. Our room wreaked of stale cigarette smoke, wet dog and bad carpet cleaning. You can tell this is a smoking hotel when you walk in the lobby! Other than that there are a lot of big rigs in the lot not an issue except Parking can be hard to find. You can walk to Denny's, Wendy's or subway and gas is nearby. The rooms were the smallest of all of the 6 best westerns we stayed at this trip and the most expensive. The HVAC was extremely loud and you could not keep the room temps even either too hot or too cold. There is a fridge and a microwave which is nice. Tv is fine. The wi Fi is useless at least on the 3rd floor we got one bar and could not connect to anything. You have to ring a bell at the front desk for service. The breakfast by far was the worst out of all the locations as well. The food was all cold and stale . The lady working through breakfast room was very friendly though. For people with pets this was the only BW where animals can go under beds which is a bad thing for pets. We had to spend half the morning down on our hands and knees trying to get our cats out from under the beds down on our hands and knees on the nasty carpet. I would not stay here again primarily because of the smoking. I think if I were a smoker I would be happy to find this hotel as it's a rarity. Otherwise no. Truck parking, smoking rooms. Front desk woman was very kind & friendly. Our room was extremely clean & quiet. Our room faced the front parking lot & we never heard a sound. The hot breakfast offers fried eggs, sausage, bagels, Danish..and then the cold selections were endless. Reasonably priced & a nice clean place to stay. "Poorest Best Western we've experienced"
Poor lodging? How can I count the ways? When I saw the groovy rating of "9+" on Priceline I thought, "How could I go wrong?" Well, this lodging begins the poor corridor of Ohio, and ratings are relative, here. We have stayed at some nice Best Westerns; this is not one of them. OK, you know those $28 Indian motels with the dirty yellow walls, badly spackled? Yeah, this is THAT motel. Begin: 1) The phone did not work, but inspection revealed no cord to outlet ... a good reason. 2) The tile floors are greasy. I know this as my cane tips could not grip the tile. 3) Bed sheets do not fit the bed, and threaten to pop off. Only a couple of inches of fitted sheet fit over the corner. 4) Pool has overwhelming smell of chlorine, which filters into the lobby, through the closed doors of the pool area. 5) Small pillows filled with foam chunks. Very uncomfortable. 6) No desk pad, pen. No real half and half for coffee. 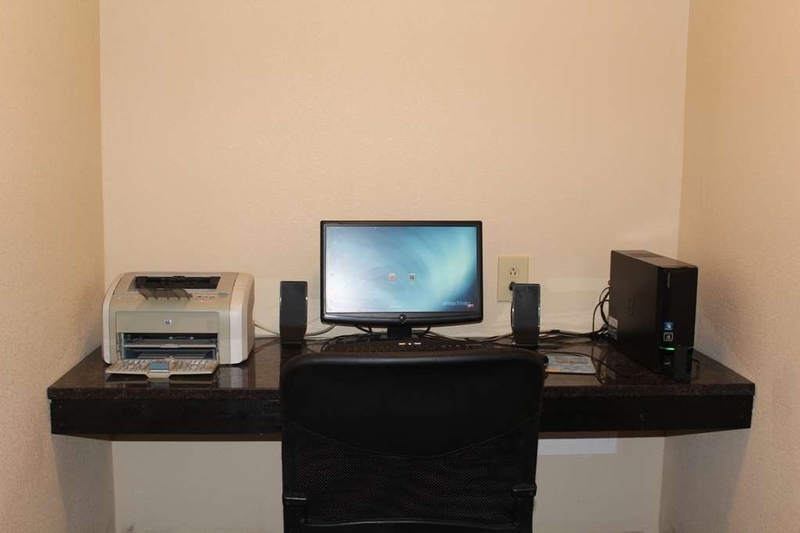 7) "Business center" is an alcove with one computer and one old printer. 8) Poor breakfast 9) Only one bar of soap in bathroom. The vanity is not large enough to accommodate two shaving kits. 10) The a/c has some odd Glade-type air freshener odor coming out of it. This is a working-man type of lodging, in a blue collar area. Zanesville, like so many others, are former factory towns fallen on hard times ... for the past several decades. This motel reflects the poverty. The front desk help is also doing the laundry. How can anything be good? This is not a $99 room, as listed. There are no luxuries here. I first want to apologize about your stay here with us, as our guests are our #1 priority. 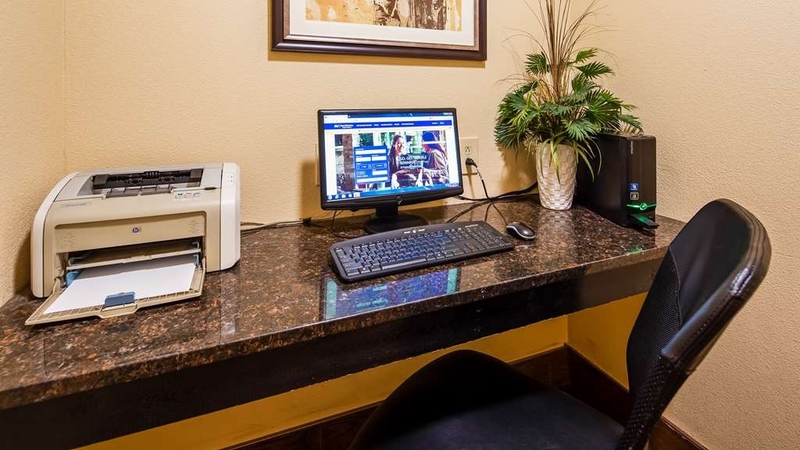 If at anytime you need anything during your stay please call the front desk and we can get you new items, extra items or anything that we have that we are able to accommodate you with or fix any issues so that you can have a wonderful stay here with us! We want you to enjoy your stay here with us. Stayed one night, passing thru. Was a very nice stay, the hotel was clean and the staff was very nice. I wish this would allow me to write my own review, though and not require me to write 200 characters, makes me feel like I am in college again. I stay at this hotel often due too work travel, I choose this holtel because of conveinence to the area restraunts and freeway. The staff is very helpful and kind and the rooms are clean and cozy. The beds are very comfortable and I always get a good nights sleep. Ware this hotel is located it is a safe area and I've never heard of a problem with crime on the property. "I would not stay away"
I am not sure what other people have experienced, but we had a good stay at this BW. First of all we booked on another website and BW did not have our reservation. The BW representative was kind, patient and did everything in her power to make things right for us. She told us where to go for a discounted dinner. The breakfast buffet was well stocked at all times. And, when we left we discovered that my husband left his very expensive pillow in our room. They eventually returned it to us. It took a while as they required a postage paid box be sent to them. I know that it was not top priority for them, but we did get it back in less than two weeks. So thank you BW Zanesville for being so nice to us. "Don;t stay in room 104"
The room had a small bath and was not totally furnished. The easy chair had been removed, leaving only the desk chair which would not adjust up and down. The bathroom sink surface was entirely too small. Be sure to grab the handrail stepping out of the shower - it;s a long step down. The room and bath were clean and the bed comfortable. Marginally OK for a guy traveling alone if he can negotiate a good rate. Ladies who use any amount of make-up are going to need more counter space. If you like a rude and condescending person at the front desk, this is the place for you. If you think working smoke detectors, water pressure, and not hearing people across the hall from you as clearly as if they were in your room are optional, this is the place for you. If you want working appliances, a quiet room, and front desk staff that doesn't give you the third degree in a rude manner (did you plug in the coffee maker?) then I would go anywhere else. Best Western should be ashamed to have its name on this building. Stayed at this hotel on a Sunday night. The lobby and rooms were very nice. My mother is handicapped and this is first hotel of the four we stayed in on this trip that was able to provide a double room with handicap accommodations in the bathroom. The accommodations were wonderful with lots of grab bars and a fold down shower seat. The room was very nice but did not have a refrigerator or microwave. Breakfast was a little disappointing no waffles had a pancake maker instead but it was not working. Sausage, gravy, biscuits ( they were cold) eggs, heated all in the microwave but still tasted off. They did have yogurt bar selection of different flavors of yogurt and a variety of toppings. This was very tasty. We got to breakfast right at 9:30 and we were accommodated although it was closing time. We stayed on a Sunday night, the hotel had an indoor pool I was the only one using it it was very relaxing. They even had a hydraulic chair for handicap accessibility and steps with a handrail. It was a very enjoyable stay! I loved staying at this hotel. The staff is friendly and caring to your needs. 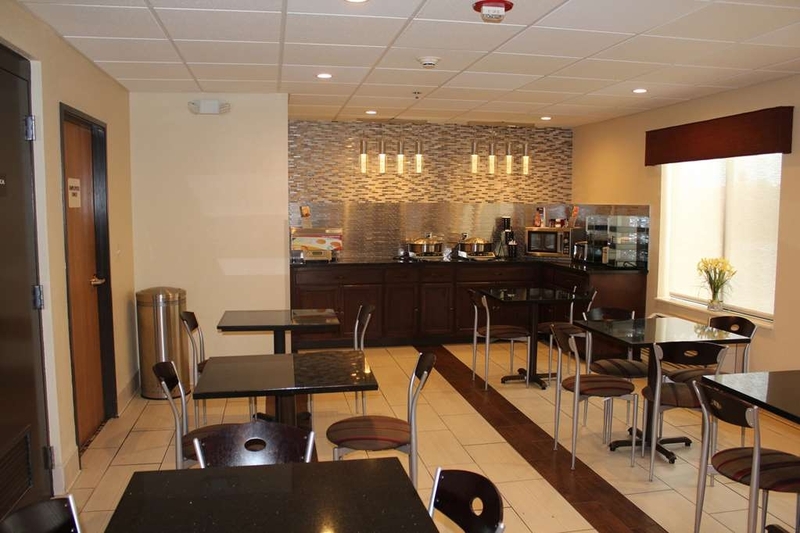 Their breakfast is great and their location is near virtually everything you may need, food, fuel, shopping. 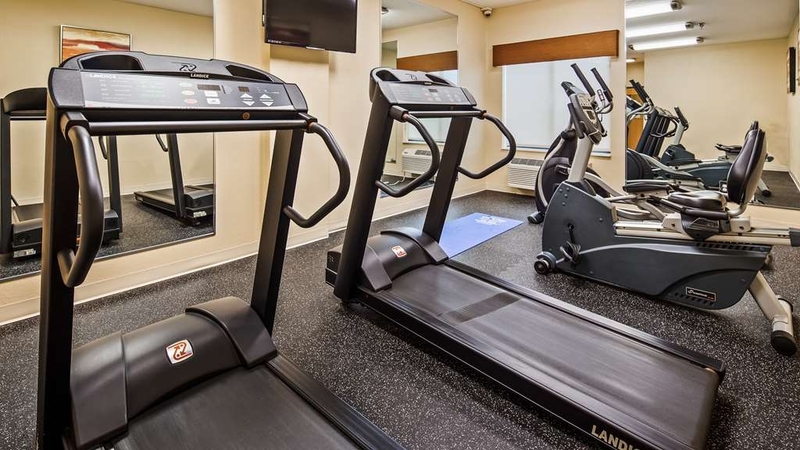 It has an indoor swimming pool for relaxation and enjoyment and it also includes a fitness room. It's my 3rd time staying there and I plan to book future stays there, it's so nice and extremely clean which in my book is a plus. Very nice hotel. Friendly service, clean rooms, large shower towels and nice breakfast. Our room key also allowed us a 10% discount at the local Denny's restaurant. We did not use the pool but it was heated, clean and looked very inviting. I highly recommend this hotel! Thank you for completing the survey regarding your recent stay at our property. Your business is very important to us and we value your feedback. By telling us what you liked about your stay and how we can improve, you are helping us deliver a superior experience for you and other guests in the future. We hope you will come back and see us again soon. If I can be of assistance in the future, please don't hesitate to contact me at 740-453-6300. Thank you again for taking the time to complete the survey. We appreciate your loyalty to our brand. This hotel was right off I-70 and seemed nearly full, even on a weeknight. I'm not surprised, because it was excellent and a great value. The room was clean, comfortable, and spacious, and there were tons of TV channels (cable, not dish). Front desk was very pleasant and helpful. The lobby was very nice, and the pool looked great. Late-afternoon cookies were a real treat, and I was pleasantly surprised to find cocoa packets available in the afternoon. We left before breakfast, so I cannot comment. I always like to mention in my reviews the most negative thing I can find. I thought that would be the lack of a channel guide – we spent a great deal of time scrolling through the on-screen guide, trying to find our favorite channels. But when we were checking out of the room, I found the guide on the back of the hotel info sheet (and the channel numbers were accurate). That left me with about nothing to criticize – maybe a small clump of dirt in the hallway! The hotel was full of truckers, coming and going throughout the night. That understandably created some hall noise during the wee hours. Light sleepers should ask for the quietest room, probably on a higher floor (we were on the first floor). If you are economy-minded, you'll love this hotel! "i Stay here when driving through"
This is a decent hotel in Zanesville Ohio. Cute name. Everything is satisfactory. No reason a businessman or family or a person on vacation would not like this hotel. Nothing really out of the ordinary but it is a Nice Best West hotel. We have been staying at this hotel for years for deer hunting season. Great value with the Hunters special. Rooms are always clean and the internet works great. Thanks for another great stay as usual. See you next year. Our trip was a last minute decision. We didn't want to "break the bank" for a trip that would last only 24 hours. The pictures online were accurate. We got exactly the quality that we saw in the pictures. It was a good stay. We stay at this facility annually on our way back east to visit family. It is always our favorite stop over the past 20 years. From check in to check out, everything was just as it was supposed to be. An amazing experience. "Always enjoy our stays here." We always enjoy our stays at this hotel! Rooms and common areas are always clean and in good working order. Staff is always courteous, pleasant and professional. Breakfast was good for being a "continental" styled fare. They also allow pets which is a necessity for us when we travel with our 2 large dogs. Always stay there when traveling through the area and highly recommend the hotel to everyone else! I try to travel about once a quarter. Each trip includes our family dog, but finding a pet-friendly place isn't always easy. 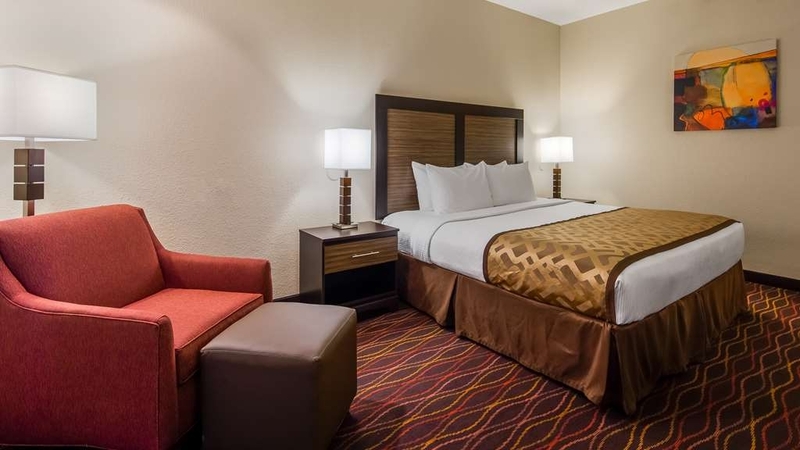 Best Western makes our trips worry free! The additional pet fee is the best-spent money ever. "Smells like smoke and noisy!" Thin walls and noisy. Bad customer service from Angie at the front desk who had the opportunity to rectify the situation. I would keep driving to the next city. They have a nicer hotel near the boarder. Keep driving! I am sorry you were not happy with your stay with us. We strive to give the best customer service for each one of our guest. Unfortunately our pet floor is also located on the 3rd floor where there are a few smoking rooms as well. A discount was placed upon checkout for any inconvenience during your stay and was further taken care of after the stay as well. If I can be of any further assistance please contact the hotel directly and I will gladly speak with you personally. I hope you can give us another chance in the future if you are in our area again to make sure that you have a pleasant experience here with us. Fairly comfortable and quiet. Beds were not extremely comfortable as I expected....a little lumpy I thought. All pet rooms are on third floor with one slow elevator. Also smoking rooms were up there top so the smoke smell in the hallway was nasty. The room was ok and clean with no odor. Shower had good pressure. Very nice hotel! The lobby and rooms were like new and didn't have that musty or dirty carpet smell that can be common in hotels. Like all Best Westerns, the rooms are big and include a microwave, small fridge, coffee maker, and desk. They also sanitize their TV remotes and practice green policies with their laundry. The evening desk clerk, Sherri, was so friendly, genuine, helpful, and sweet! She gave us advice on local restaurants and provided addresses for places we wanted to visit. She was very knowledgeable and professional and made us feel valued and very welcome. The staff we encountered everywhere in the hotel was friendly and hard-working. Their breakfast was delicious and included an automated pancake maker. That was pretty cool. I highly recommend this hotel! Hotel was easy to find off the highway and is near sit-down and fast food restaurants. Room was clean and nicely laid out. Will stay there again. Was close to were my business is located. Was pleased with sound proofing of building. Breakfast was a little spread out, but was able to locate everything I needed without asking. Check in/out was quick and efficient. Everyone make a great effort to make your stay comfy if you forget something they may have it. Beds are great and pillows. I always get a great nights sleep. Plenty of places to eat close by also from fast food to knife and fork. The hotel was mostly as expected. Disappointingly, I was refused the normal AAA Discount upon checkin, because "The computer isn't taking them tonight." Otherwise, a normal Best Western hotel. Good for a rest on a long drive. Disappointed with my stay.They would offer you promotions but now nothing just look at you and say by. I hope they can give the service that you are paying for. Fix the water pressure.and let the customer know what the room charges are if you are going to charges different fees per night. I apologize that you were not recognized as a BWR member this will surely be addressed. We strive in customer service and want each of our guests to know that we appreciate each and everyone of them. Again I apologize and hope you can stay with us again in the future. This is to be a smoke-free hotel. We had two pets, so they switched us from first floor to third floor. The third floor is with the smoking rooms; the hotel has all of the stickers that this is a smoke free building, I had to sign the smoke-free waiver for the room. There are 16 rooms for smokers, but let's clarify that I thought I was at a concert, with the pot smoking on the third floor. But, let's also include the busted door that was unsafe and one could see in our room, or if they wanted, break in. Told the front desk and the response was, "I am sorry". When I asked for another room, response was, 'we are sold out." There are no other rooms available. Upon check out, I indicated my displeasure and was told again, sorry, and that maintenance is in a new door frame. Honey, that is not going to help, when the door is too small for the frame. I want to apologize that you didn't enjoy your stay with us. We strive to make sure each of our guests have a great experience here with us during their stay. Our hotel is not a smoke free hotel, we have no smoking signs out front where we do not allow guests to smoke around our entrance to the lobby. We do have 10 allotted rooms on the 3rd floor that are smoking rooms and the remainder of the 3rd floor is non smoking rooms. The 3rd floor also serves as our pet floor as well. The issue with the door has been fixed by maintenance as a new door frame was put in upon your departure, so we thank you for letting us know about that issue. If there was another pet room available that night that we were able to accommodate you with we would of gladly done so. Again I am sorry about your stay and hope you can give us another chance in the future to make sure your experience with us is great! "Don't waste your money !!!!!!! " Horrible is all I can say ...if there was a zero rating I wouldn't even give it a one star rating we will never stay at this hotel again !!!! upon arrival we went up to the 3rd floor where our room was located and ALL you could smell was cigarette smoke they didn't mention that half of the 3rd floor was non smoking rooms and the other was smoking then we opened the door to our room and it smelled like a wet dog not very clean at all . There arent very many places to eat around the hotel there is a dennys cafe but the food is horrid and theres a mcdonalds and a wendys . the only good thing I can say about the hotel is that the staff is very friendly . I do not recommend this hotel to anyone . I am sorry that you did not enjoy your stay with us. We strive to make each of our guests have a wonderful experience during their stay. Our 3rd floor does have a few smoking rooms at one end and the remainder of the floor is non smoking rooms and it is also our pet floor. I do apologize that upon check in that you were not asked if you had a pet as we would of accommodated you to different floor based on our availability. I wish we could have addressed this issue when you were at our property as we could of moved you to a different floor. Please if there is ever an issue let us know and we will do our best to accommodate you to make sure you have a wonderful stay with us. I do want to say thank you for the kind words about our staff and I will surely pass that on to them. Again I apologize about your stay and if you are ever in the area again I hope you can give us another chance. Have a great day! My stay at Best Western was very nice. Room was clean, comfy beds with nice pillows, breakfast had pretty much everything you would want,,myself only had yogurt with granola. Front desk was very welcoming. All in all this hotel was perfect for girls night out place for us to stay. The hotel was clean. It was located right off the interstate exit. Denny'Diner across the road was a welcome change from fast food. Breakfast was very good; the staff was pleasant and helpful. I liked the paint color in our room; it was cheerful. Had a great stay! Clean, price, and staff all excellent. Will stay again. breakfast above average for us. enjoyed a good nights sleep for a good price at Zanesville Best Western . Staff was helpful and polite. I am glad that you enjoyed your stay with us! Rooms that have connecting doors can have a little more noise level then ones that do not. I apologize for that. The time you had stayed there was a dog show going on in the area so there were a lot of pets at our property. I hope to see you again when you are back though our area and have a great day!! "Nice motel but there was a problem"
The room was nice, the continental breakfast was good, the staff was attentive and very nice, but we got charged twice on our charge card for the following night after we checked out the day before. The price was more money on the second charge, but they couldn't see where it was charged. Just shows up on my credit card statement???? I am glad that you enjoyed your stay with us we appreciate the kind words. I do apologize for the issue that you had with the double charge. The issue has been looked into and resolved if you have any further questions or I can assist you in anyway please contact the hotel directly. Thank you for staying with us and we hope to see you again, have a great day! The Zanesville Best Western is a very nice hotel which I have often booked whenever I am traveling through Ohio. The staff our courteous and helpful and the breakfast is pretty good. The rooms are quiet, except for the constant humming of the refrigerator. There are a lot of small, quaint shops which are nice to visit within 5 minutes of this hotel and it is located just 5 miles from downtown Zanesville, so you're not right in the city, which is something that I like. It is located right off the highway, so easy on/off access, but you don't hear the highway noise. Overall a very nice hotel. Thank you for the kind words, we appreciate it as we strive to do our best. I will make sure I pass on the positive feedback and comments to my staff. Thank you for staying with us and hope you stay with us again in the future! "Clean hotel with all amenities"
We needed a hotel close to where the wedding we were attending was and one that was pet friendly. This hotel had everything we needed. The breakfast wasn't too bad either. The only thing was we don't eat pork and that's all that was served meat wise. "Good location and Clean Rooms"
I had stayed at this hotel on a road trip in April and was quite pleased with it, so I returned here on a subsequent trip necessitating a stop in the area. I was surprised to find that about half of the parking lot had been converted to accommodate 18-wheeler parking. The night I stayed, there were 3 big rigs in the lot. 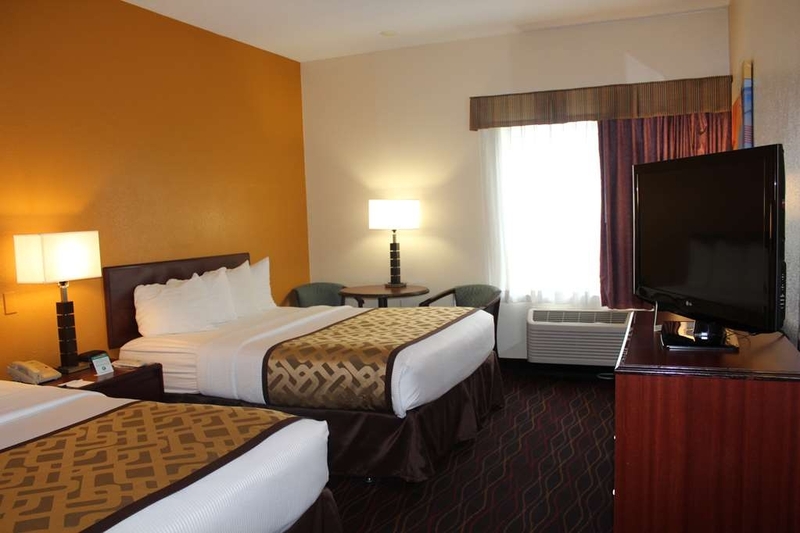 The hotel is conveniently located right off I-70 and is quiet and clean. Front desk staff was very friendly. Breakfast is very good. My only complaint was that I was given a non-smoking room on the second floor, but starting at about 10pm, i was smelling cigarette smoke coming from a room somewhere nearby and in the hallway. The smell was there most of the night. I mentioned it to the staff in the morning when I checked out, just so they would be aware that they need to monitor this sort of thing more closely. Check in was easy. Allowed me to use my travelers coupon. The room was very nice. Walls are a little thin but tolerable. The hot breakfast was better than average. Room had a fridge and microwave. Check out was easy. "My overnight stay in Zanesville"
I traveled from my home in southeast PA to attend my granddaughter's graduation from nursing school. On my way home, I had the pleasure to stay in Zanesville, OH. I was very tired from traveling and I found my accommodation to be just what I needed, a great night's sleep in comfort. Thank you. Liz had her back to us when we arrived to check in - with a reservation. She continued to silently work on her papers with her back to us. Wouldn't mind at all if she'd said hello and "I'll be right with you." Had to ask her to turn around and then she treated us like an unwanted interruption. She had an empty cookie tray there and said she ran out. OK, so get rid of the empty tray. Our standard room had no fridge or microwave. Room was clean, fresh and comfortable, very quiet. Very few cars in parking lot. Breakfast was not good. We arrived 45 min. before closing and it was not stocked. Took 5 min. for worker to BEGIN bringing out cool food. Only fruit were apples, nothing to have with cereal. Not one welcoming or special touch. "Quick stay for a family visit"
This is a nice hotel to stay at for a quick visit. It is right off of the highway. Rooms were clean, continental breakfast was good. Discounted pricing is available for AARP, which helps. Call hotel for details. "B R GUEST -- ZANESVILLE, OH"
An acceptable property a bit east of the city, convenient to freeway (no noise) and some restaurants. Clean property, but service by housekeeping and breakfast bar supervision leaves quality to be desired. -- One night -- no housekeeping service at all. Had to go get our own fresh towels at 10 p.m. No bed change or make up that first night. Breakfast bar supervision was poor, with many items low or run out well before closing time. Poor customer service / concern. We are not certain we would return. No talking candlesticks or teacups, but we were their guest for a night. Comfortable bed and spacious room. Wifi was good. Corner desk had lots of table top to it. Refrigerator and microwave. Safe with key for valuables. Discount at Denny's across the street for a meal (which we did not use but front desk told us about it). Indoor pool looked nice and other guests seemed to be enjoying it when we arrived. Small dressing area with not much counter top available (coffee pot was there). Sink with large mirror and clothes rack in dressing area. 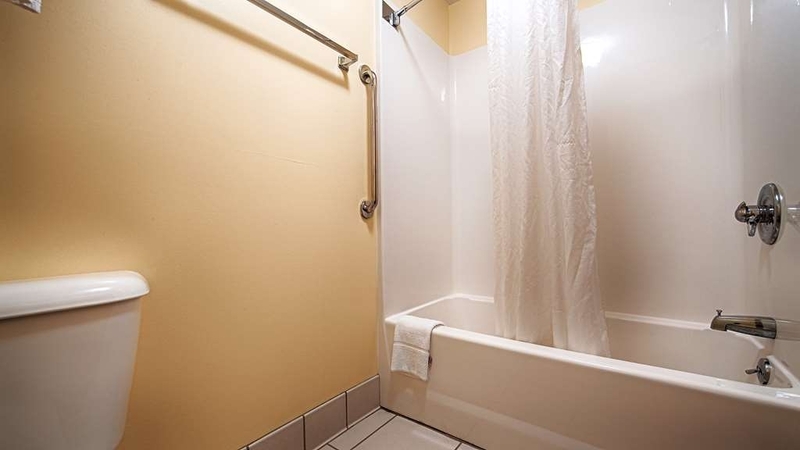 Toilet and tub/shower combo in separate room. Soft water in shower so it was a bit slippery. Toilet was not "comfort height". Breakfast was awful. Not much to offer. Pancakes cooked on a conveyor belt was unusual. Eggs looked very suspicious -- evidently not real eggs. Sausage was cold. Attendant apparently did not enjoy her job. She was very sour looking and never smiled or welcomed you. The refrigerator was empty of milk and yogurt and she acted like it was a real bother to refill it. Even stood in a corner where we could hear and gossiped about work environment with another employee. She should retire or seek other employment. Okay for a one night stay. I want to apologize that you were disappointed with your stay. Please, always let us know when you are not happy so we can do all we can to fix the issue and make your stay great! I hope you can give us another try in the future. 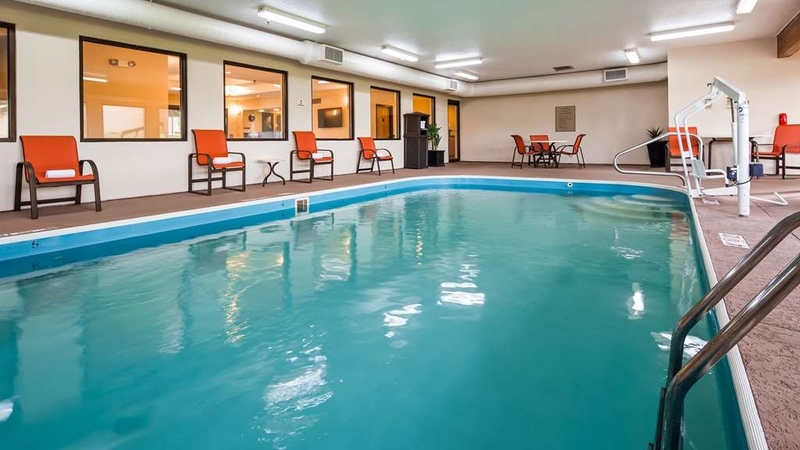 "Poor Quality for a Best Western"
"Enjoyed staying at this location"
Clean Facility from pool to room, great amenities for a fair price. Friendly and accommodating staff. Well rounded breakfast offerings.Great experience! We will definitely stay there again on our return visit. We arrived at this hotel VERY late--around midnight. We had a guaranteed reservation and the check-in process was smooth--a good thing, since everyone was tired and anxious to turn in. The lobby area floor had recently been mopped--understandably, given the hour. The room was a bit stuffy, but cooled off quite quickly. The Wi-Fi was fast and reliable. The breakfast spread the following morning was pretty typical of this type of hotel (i.e. okay, but no great shakes). All in all, it was an uneventful overnight stay, which is about all one can hope for during a stay like this one. We were on the road for a long time in order to get more than halfway home. We checked in after 7:00 pm and found that the room was very nice and clean. If we are in the area again we will look at staying here again. We are on the second night of a 5 week 10,000 mile road trip and if every hotel would be as nice as this one, I would be a very happy traveler. The room was well kept and extremely clean. The bed was wonderful and the bedding was very soft and comfortable. The shower was non-slip and the shower head was great. I would definitely recommend this hotel to anyone. "Easy to get to and very nice manager"
Check in was easy. First room was on first floor and we could hear everyone talking and shutting doors constantly (large families) so we asked to be relocated to quieter section. Second room was on top floor - this was a very quiet area. Hallway smelled like cigarette smoke but when we entered the room it was fine. I think the cigarette smell is in the hallway carpeting - maybe the hotel should shampoo or replace it and paint the hallway walls to remove the smell. Our room was clean but I had to wipe the bathroom floor twice - they used something to clean the floor that left a film. There were a lot of people in the pool but we did not use it. The free breakfast was not very good at all. We should have gone to the restaurant across the street but we wanted to get on the road again. This hotel is fine for a one night stay. "right of Interstate - easy off and easy on"
The property is quiet and clean. We were on the first floor and didn't hear any sounds at all. The breakfast is nice thanks to Dawn! The manager is very accommodating when she moved us from the third to the first floor. Thank you! This hotel was ok. The location is great and the rooms are clean. My only complaint is that the pet rooms are located on the third floor with the smoking rooms and the hallway smells like smoke. Once we were in our non smoking room we couldn't smell it anymore. I just wish they had pet rooms on other floors. Very nice. We got there late at night - midnight, and left at 6 a.m. so I can't say much except that the short time we were there, the short interaction with stay, very pleasurable. For as late as it was, they were quite alert and pleasant. Three places to eat within walking distance. "Best Western Hotel in Zanesville, OH"
The hotel was okay. Not the best hotel I have ever stayed in. There is no continental breakfast. Also, we found dirty towels and snack rappers in our room so clearly the cleaning service did not finish their job. "Lacking in Customer Service at Front Desk"
On Saturday Morning we waited a long time for the elevator and it never came. My knee was giving me trouble and I didn't want to take the steps but after a very long time I decided that the elevator was not coming. When I got downstairs I saw that the employees had the elevator blocked with their cleaning supply cart. I mentioned it to the front desk and she informed me that the elevator was prioritized for the employees in the morning and I would just need to deal with it. I did mention about customer support and ADA and she shrugged her shoulders and said that is the way their BW operated. I also gave her my rewards $10 card so that she could take it off of the bill. She was having computer difficulty printing my receipt and said it would show up on my receipt when I checked out. She lied to me. She was upset that I complained and did not bother giving my my $10 off of the bill. I had to ask for it to be corrected the next morning. This was the worst customer service I experienced at Best Western. "Hotel on the way home"
Hotel was in a low vehicle traffic area and easy on-off Interstate. Some fast food places adjacent and many more 7 miles west. Lobby was pleasant but rooms needed updating, ie chaulking around tub. but everything worked, I mean NO problems or needs. In my case, this was all I needed. The staff are very welcoming, friendly and helpful! Always have a smile on their faces. My stay was great, got some much needed rest and was able to grab breakfast before we left. On my departure the young lady at the desk made sure I had a great stay and wished me a safe trip back home! The room was supposed to have a microwave but did not. In addition, the hair dryer was broken. When I asked about each of these, I got mixed responses. The desk clerk said she could not get a microwave for us until the morning, when the maintenance man arrived. I then asked her if she could give us a discount on the room because of this deficiency. She said she could not because I had booked through Expedia. That sounds like a lame excuse. She did go and get a new hair dryer for us, but that was an extra trip to the desk for me. Those who prepare the room did not exercise due diligence. Breakfast was okay but nothing to write home from summer camp about. Spent one night and choose this hotel based on reviews of people with dogs. Know there is a reasonable $10 fee for fido. Our room was clean and bed comfortable. Nice hot shower. Decent breakfast. Friendly helpful staff. BUT AC unit is noisy and could be a problem for light sleepers. Be aware that the elevator is very slow and dogs stay on the 3rd floor. Also for some reason there was always a smoke odor in the hallway. There is a Denny's Diner across the street, gas stations, a convenience store and 2-3 fast food restaurants. Easy access off I-70. You can't always get what you want, but sometimes you get what you need. I'm from Ohio, so I don't expect much. Along an major interstate you just can't set the bar too high and this place met a low bar. The hotel was nice but starting to show it's age. We had a king bed suite. The room could have been a little cleaner although it wasn't bad. The staff was friendly. The hotel is just off I-70 but about 5 miles from downtown Zanesville. For the price, it was an okay hotel. This hotel was very clean and the breakfast was good. The bed was very comfortable and the room was nicely decorated. The variety of foods was served at breakfast. The lady in the breakfast area kept the food filled and the tables clean. It was easy to get off and on the interstate. Clean hotel, pleasant decor, comfortable bed, good water pressure, friendly and accommodating staff, and good variety of breakfast item. If every in the area again, I will choose to stay there. Thank you! Room was nice, bed very comfortable and the room was clean. Nice quiet location, did have a cigarette smell in the hallways. The refrigerator had broken nobs to adjust the cold, but someone from the front desk came up and helped us with that. Bathrooms nicely appointed, good towels and linens. Front desk folks were very friendly and it was very convenient to the Denny's nearby. I would stay there again. We stayed one night at the BR Guest Best Western. I love the name by the way. The rooms were very clean and the hotel grounds were decent. The pool looked clean although we did not use it. There was even a lift for those with physical disabilities for the pool. Breakfast was well stocked. The beds were extremely comfortable. My only complaint is that the vending machines were not stocked or working properly. I am happy to see you would stay again. We are in the process of making updates and changes to the rooms and hope you return to see those changes in place .Thank you for your comments. Our team stayed here for the weekend in May. The staff at this hotel was top notch! They were very accommodating to our group. The rooms were clean and fresh. The pool is sort of small. Breakfast was quick and easy. Our group will definitely stay here next year. We are so glad you had a good stay and a quick breakfast! We pride ourselves on having clean rooms and our staff does their very best to make that happen daily. We look forward to your return. Thank you! Sink water was hot, but the shower was cold. I don't have any more to add. I don't have any more to add. I don't have any more to say. I don't have any more to write. I don't have any more to type. I don't have any more to report. I appreciate your survey responses! I have had the issue looked into and it has been taken care of. Thank you so much for your input and I hope you return to our property soon! Good clean and very friendly staff except for the lady who was working thirds Miranda I came down to get a couple things and she was on her phone at the front desk and was very rude when I asked for extra towels. Other than that the room was very clean and the other staff was friendly. I do apologize for the employee's unprofessional behavior. We strive to have friendly staff and do appreciate you bringing this to our attention. It will be addressed and will not go unnoticed. That is not how we want to represent our hotel and hope you return. Thank you for your honest review of our property. My daughter had a regatta in town. We stayed for two nights. The hotel was clean and the staff was friendly(they were great with all the teenagers that were there! )The beds were comfortable. The hotel was located near the freeway and had a few restaurants that were great for quick snacks. Thank you for the kind comments about our hotel and staff. We are glad you enjoyed your stay with us and hope you return soon. "One Nights Stay - Good"
I stayed just one evening. The staff was nice and helpful. Similar to most Best Westerns. The room was plenty adequate and very clean. Although older decorum it was nice. A pool was available. Parking was good. Close to a couple of fast foods. (walk-able) A gas station with mini mart was across the street. I would rate it good as long as you don't need plush. Thank you for taking time to review our property. We value all feedback and thank you for taking the time to do so. I may be pickier than some but I will not stay here again. The good side is the staff are friendly and low rates especially if you get a corporate discount. Im sure my company does because they picked this place not me. I work on the road and I have nothing against truckers, oilfield, linemen, etc but this place is commonly used to house large crews of rowdy no rules types that have the whole floor i was on smelling like cigarettes. We apologize for your recent stay not being pleasant, we have addressed the issue with the noise. We do have some smoking rooms in our hotel still on the 3rd floor and sometimes the hallway will have an odor from them. We strive hard to give our guests a great experience and again I do apologize and hope that you stay again and give us another chance. Thank you! I'm a truck driver, this place had truck parking and is close to a loves truck stop. The service was excellent and the rooms were excellent and clean. I would recommend this best western as a place to stay to others. Thank you for the positive review of our property. We value all feedback and thank you for taking the time to do so. I stay @ this hotel often and I sleep great beds are great and pillows and I never hardly get woken up by other guest. The staff do a great job, always cheerful and helpful. Thank you Liz for doing your best to make my departure a good one. Thank you for your kind comments about our property and our staff. Liz is definitely a great person to have with our company! "GREAT QUALITY HOTEL WITH FRIENDLY STAFF"
a cozy setting which was located at the skirts of the city. the staff handled all questions and concerns immediately which makes anyone feel at home. the rooms were spacious and the pictures were very pretty. the brochure described the hotel exactly! To my surprise, my reservation was confirmed at the front desk and I was ensured I got the best price based on available discounts based on qualifications (e.g., AARP, Govt, Military, Senior citizen, etc.). Because of your hospitality, I already booked another stay! Stayed at this hotel one night in April on a long drive from the East Coast to Muncie Indiana. This Best Western was a pleasant surprise. 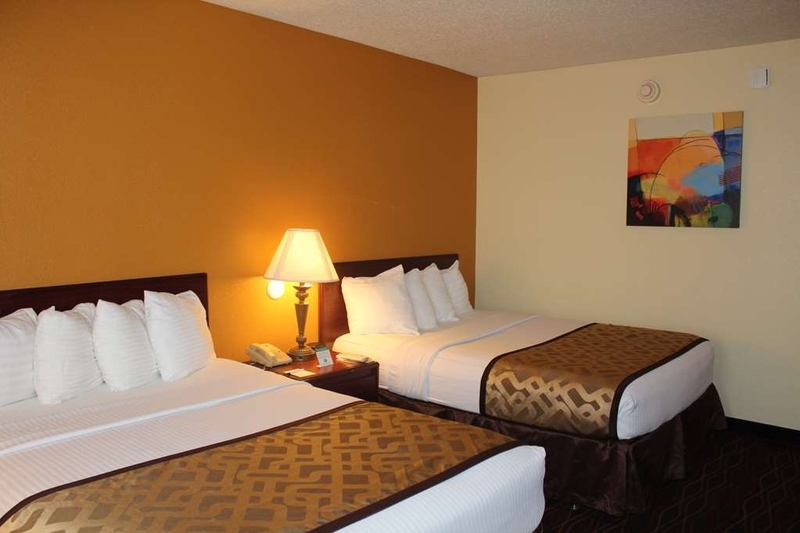 Very clean, rooms were updated, towels were very good, water pressure excellent and the bed was comfortable. It was a good value for one quick night's stay. I cannot say enough good things about this hotel. We were relocating across the country when we had major car trouble, and we were lucky enough to make it to this hotel before the car gave out on us completely. The manager, Rosie, is terrific. Even before we decided to stay (our car turned out to be beyond repair and we had to replace it), Rosie made us feel right at home-she told us to help ourselves to coffee/tea/hot chocolate, and to feel free to use the restrooms and business center. We ended up staying for three nights, and it was great! Our room was very clean and bright, and the hotel is right near a Dennys and McDonalds. I had a great experience here, and would definitely recommend this hotel. Also, the breakfast was good! In my opinion, great value for the money.This hotel also has a pool. staff was accommodating; rooms were well-maintained; used the wifi capability which was easy to access; breakfast was very good and dining was good across the street; and room was a good value for the money; we will probably choose this site again as it is close to basket shopping. Awesome! Had to stay there over Thanksgiving and was welcomed as if I was part of their family. Clean, friendly and courteous. Indoor pool. Good variety at breakfast. Close to Colony Square Mall, which has an indoor train to ride. Restaurants .. several to choose from. 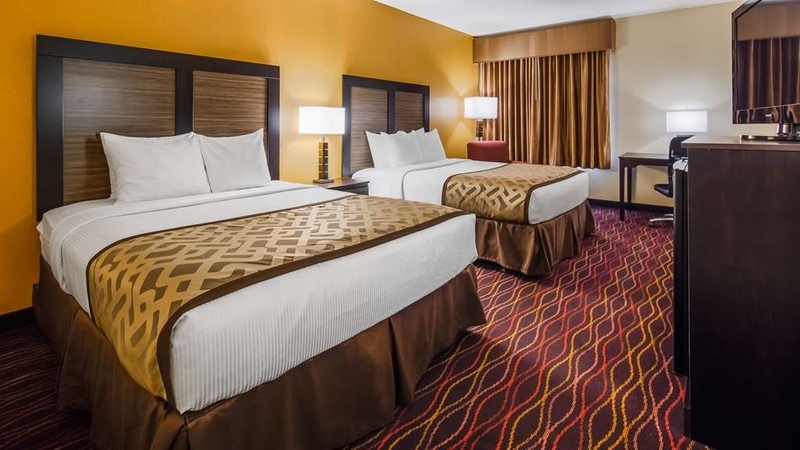 We are thankful to have you stay with us during the Thanksgiving holiday! We are glad it is located near the location you were headed to at the mall. Thank you for all your kind comments! I needed a room in my own home town ASAP, due to home improvements gone wrong. They accommodated me immediately. I had to pack quickly, and forgot things, they had everything I needed. Teresa at the desk, was very friendly on the phone, and when I arrived. I had told her I had a bad day on the phone, and that I was getting Olive Garden. When I got there, she asked me about my meal, and told me about their awesome heated pool, that maybe that'd soothe my blues. I would recommend this hotel to anyone. It felt like home, when I needed it the most! It is great to read that you had a much better day once arriving! We are pleased also that Teresa was her usual friendly self and had the items you needed for your stay. I hope your home improvements went well and happy you felt at home with us. Thank you for your kind words! Stopped here traveling through to my daughters and we were pleasantly surprised with our stay. We had a couple dogs and was so happy to find a nice clean hotel that allowed pets. The breakfast was decent, we aren't big breakfast eaters but I did have eggs and a bagel. They had hot coffee in lobby and also cookies at the counter which is a nice quick snack after being on the road. The staff at the hotel especially the front desk girls are extremely friendly and welcoming, they always had a smile on their faces both check in and check out! If we ever are through this area again the wife and I will definitely stay again! "Clean, convenient and cost appropriate"
The BW was nicer than expected. The room was relatively large, clean and comfortable. The furnishings were dated but the bed was very comfortable. It was quiet and convenient to the interstate. Breakfast was okay expect the cereal was stale. There was a paucity of fat free dairy products for those on a diet. I am happy to hear we were better than your expectations! I do apologize about the cereal & I will get that taken care of. Thank you for all your kind comments, we value all feedback. "Great value and clean hotel"
This hotel surprised us. It was very nice and clean. Teresa at the front desk was very helpful with directions and recommendations for local restaurants. We enjoyed our stay. One exit from a lot of restaurants but well worth the price. We visited this hotel this summer and I would never go back. First of all, the room was nice and clean but the mattress was so lumpy and the pillows felt like there was broken up pieces of foam in them. Needless to say, we didn't rest well at all! Then the next morning we go down to the breakfast buffet. The lady taking care of it was not paying a bit of attention to the fact that the coffee was gone and there wasn't any bread for toast. Some man went in the back and got the loaf of bread and put it out. Then the sink in the back must have been clogged and instead of closing the door to take care of the situation the lady was plunging the sink with the door open and people sitting there trying to eat! Unacceptable! This was a very nice stay. Our room was very clean and had all the amenities you could use. It even smelled clean. I would definitely stay here again. I would recommend to my friends and family for sure. The water out of the sink faucet comes out as a slow to medium spray. I had never encountered that before. I don't think Zanesville is under a water restriction so I think it is only a way for the motel to save money on their water bill. 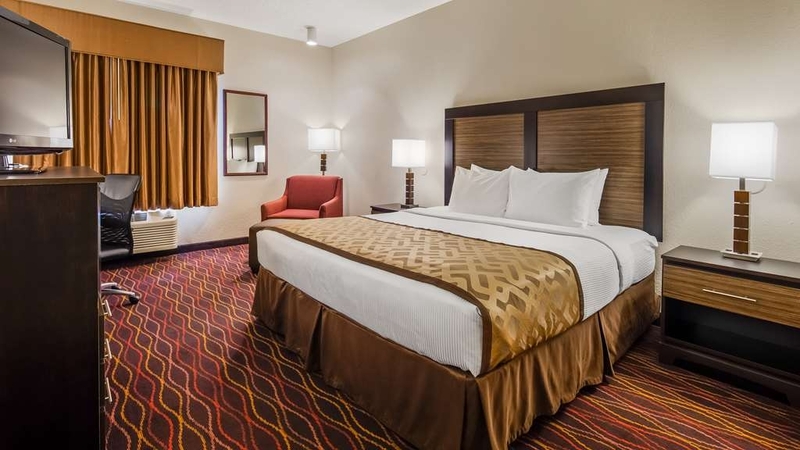 My husband and I were driving east on our way home from a cross country trip and we needed to find a hotel for the night in the Columbus area. Unfortunately the hotel chain we usually book didn't have any rooms available and we had to drive a bit further to find a hotel that could accommodate us. We found this hotel on-line and we had previously stayed in 2 other Best Westerns on our trip (Exeter CA and Winter Park CO). They were okay so we went ahead and booked this hotel. It was very disappointing! The parking lot and driveway are not as they appear. It was a big concrete/asphalt pad with concrete barriers. It looked like a truck stop. Portico area was beat up and landscaping and outside area looked neglected. I was somewhat encouraged when we entered the lobby as it seemed to have been updated and looked fresher. So did the breakfast area which had nice paint, tile, and furniture (although it was very small). Even the hallway gave me hope as it again looked as if it had been painted and carpet didn't look too bad. That's the end of the good news. The room was nasty and beat up. The walls were a bright yellow and dark mustard color but it seemed so dark in the room. The sheer curtain on the window had a tear in it and the hem was coming out. Furniture looked old and the room lighting did not help as they were old too and didn't bring a freshness to the room at all. The mini fridge didn't appear to work. Mattress on the bed was pretty saggy however the linens on the bed looked clean. We had a hard time finding enough outlets to use for all our electronic devices. Breakfast was okay but unlike the other hotels we stayed out we didn't see anyone working the area to make sure things were stocked with sufficient food. The breakfast seating area was very small so some people sat in the lobby. I was very happy to leave this hotel and would not recommend it to friends or family. I took a bus load of 40 people to this hotel on the way to the East Coast. 5 of the people reported finding short curly black hair on the sheets when they pulled the linens back. One person who had 2 beds in the room, said it was obvious one of the beds had been slept in and not changed. They then slept in the other bed. Breakfast was good, but the seating area is extremely small, so many had to take their food to their room to eat. Front desk seemed indifferent. No housekeeping staff were ever seen cleaning the lobby or the elevators. I will not stay here again. "Overnight stop on road trip"
Good hotel just off the Interstate. Wonderful front desk ladies, both on check in and check out. Good price for a comfortable room. There is an indoor pool but we did not have time to try it out. Denny's just across the way for a quick dinner or a great breakfast. Thank you for your kind comments about the property and the staff! If you are in the area again I hope you return and get the chance to use the pool as well. Overall good stay. Hotel website states there is a hot tub on site, but there isn't one. Pool looked okay, but we didn't swim. Breakfast was good, but we were later getting there (9:30) and items were picked through and cold. This is a freeway motel about midway between Columbus and West Virginia. It's about an 8-hour drive from New York City, so travelers from the mid-Atlantic and southern New England areas may find it a convenient stopping point on a drive west. The property is clean and comfortable, and at less than $100, including taxes, the price was right. The chairs in my room showed a little wear, but the beds were fine. There are a few standard restaurants – Subway, Wendy's, McDonalds, Dennys – in walking distance. 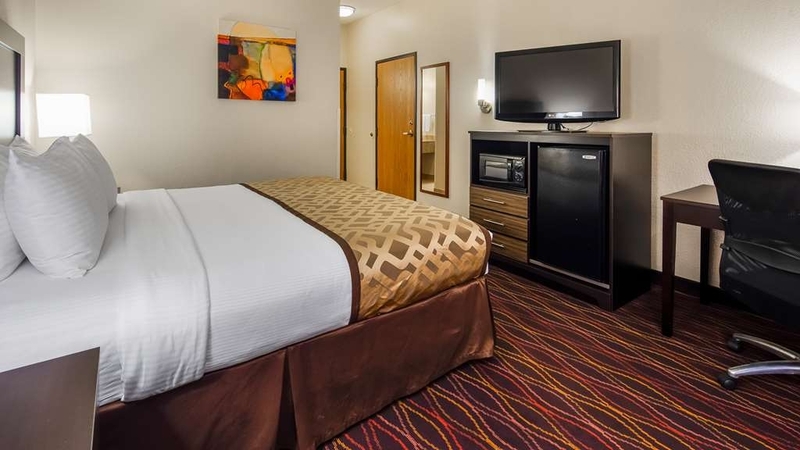 Any traveler who happens to be on the east side of Zanesville, Ohio, when it's time to stop for the night shouldn't hesitate to check-in at the B.R. Guest Best Western. Traveling can sometimes be a pain. And a good nights rest after driving all day is a must. All too often, the beds at hotels aren't the most comfortable. Not so at this Best Western. 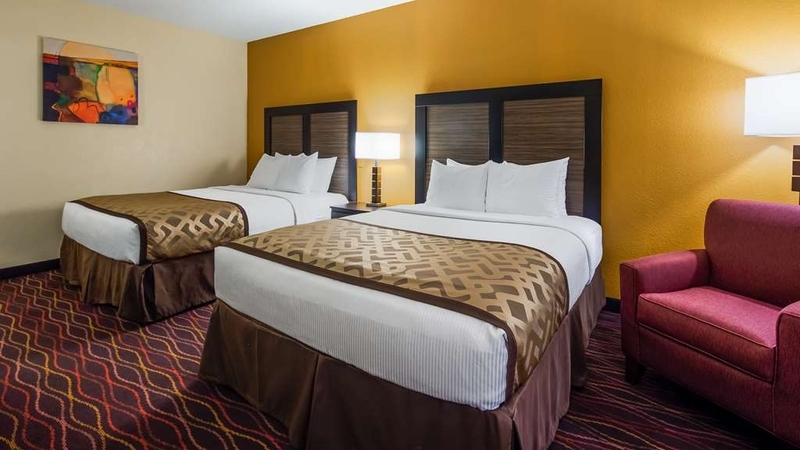 Very comfortable beds, clean rooms, and super easy access from the interstate. This was my second stay at this hotel and it is now my preferred hotel when traveling east. There is also a free breakfast provided. Not the best I've ever had, but tasty and not crowded which is a huge plus. We are so glad you returned to the property after a positive stay! Cleanliness and comfort are two big things we strive for here. Any feedback on breakfast is appreciated, as we are always looking for ways to serve our guests the best possible way we can. Thank you! This was a nice hotel. Staff was very nice & check in was a breeze. I wish I had arrived sooner, so I could have enjoyed the comfy room longer. Room was well-kept, nicely furnished, & I loved the desk which allowed me plenty of space to work. Breakfast was wonderful - I love hotels that provide something more than waffles as a "hot" breakfast. Stay here if you're traveling through Zanesville - it's definite must! I am so glad you enjoyed your room and the hot breakfast! We hope you get to return if in the area! Jim, we are so pleased you had a pleasant stay with us! Thank you for your compliments about the staff and property both! We greatly appreciate it! "When you have children with you!" This was our second stay at this place. We liked the second time as much as the first. Check-in was smooth. The room was very comfortable. There is some hallway noise getting into the rooms but that is very common. Everything worked. Breakfast was nice. The lady attending to the breakfast was very good. We are so glad you returned to our property after having a positive experience! Thank you for the kind comments about Dawn the breakfast attendant, I will pass those along to her. I found the hotel to be clean, it was an older facility, but it was well maintained. It did not have a refridgerator in the room, but did not really matter, but I am used to having one in the room. Overall I found the hotel to be clean, the staff friendly and professional, and the service excellent. Thank you so much for your kind words about our property and the staff! We greatly appreciate it and hope you return soon! You cannot take motel rooms that have had smokers in them for years and change them to non-smoking rooms without a major cleaning and removal of the furnishings. The room and hallways reeked of cigarette smoke. The rooms have not been changed from smoking to non smoking. The hallways do sometimes have an odor and I appreciate your feedback on that! Thank you! "Extremely nice staff and fairly priced." I am not used to staying at Best Westerns and was happy with my overall experience. I was bringing home a rescue dog and this BW allowed pets which was awesome. When I called early in the AM the desk was extremely friendly and this is what really made me choose this BW. When I arrived that night, the same in person friendly service. This seems to be a heavily used hotel for truckers and bikers along with pets I figured to have a restless night because of noise. I didn't and truly did not hear dogs or vehicle noise. The mattress was old and lumpy but that's about it. If you have a pet and are traveling through, this is the place to stay. Well done. We are glad you were happy with the staff and your stay. I will look into the mattress issue and truly appreciate your feedback! Overall this is a good hotel. The king size bedroom was rather small. Least the bed was comfortable and the ac worked good. Bathroom needed updating to say the least. You open the bathroom door and you basically run right into the toilet b/c it is next to the door. Shower water was lukewarm at best. Breakfast was terrible--would go to the McDonalds or Dennys next door instead of wasting my time. Breakfast room shoved into a little corridor. Thank you for all the feedback, it is greatly appreciated! We look forward to your stay each time Jim! You have a friendly face every time and it brightens up the lobby. Thank you for your years of patronage and your kind words. It really does mean a lot to us! The front desks staff were great, very help and always a big smile. THE ROOM WAS GREAT AND CLEAN THE POOL WAS VERYCLEAN AND WELL KEEPI would stay again for how nice they were god bless chester crague. So glad your visit was great & clean! Thank you for your praise! This is a great hotel with the BEST staff out there. I know that the atmosphere of an establishment is always top down so kudos to the higher ups, but I have to tell you everyone from the desk clerk to the waitress at the free breakfast went out of their way to make our stay perfect. I like to stay where they allow pets and this Best Western welcomes them with only a small fee. Even though we don't usually travel with our sweet girl, I like having dogs around. So sometimes the rooms don't always smell fresh, but not this hotel! Our bed was comfortable, and the room pleasantly decorated. A special thank you to that breakfast girl with the big smile, who worked so hard to keep everything stocked and get me that extra honey for my coffee. So glad your stay was perfect!! I will be passing along your compliments to all staff and I want to thank you for them and myself! "It was a nice and clean"
We had a non smoking room. However, when we got off the elevator on our floor it smelled like smoke. It was very heavy and we were thankful it didn't filter in our room. Also upon entering the room it had a slight odor of smoke. I think its because there was no air circulating. Once we had the air conditioner on for a while the odor was not that bad. I truly believe that the hallways need some kind of air circulation in order for it to clear the air. I will take your feedback and pass that along. I do apologize for the odor. We were traveling back and forth between San Diego and Connecticut by car and stayed in quite a few hotels during our 17 day trip. Many of them were not as handicapped accessible as they claimed to be. This hotel had great amenities for a person in a wheelchair including a lift for the pool. We checked in around 9:00 at night and the staff was very friendly and helpful. They even had chocolate chip cookies at the front desk! All the girls at the front desk were very friendly and cheerful day and night! I never saw them without a smile on their faces. They were able to answer all our questions about places to dine and places to see. They made checking in and out easy. We had a problem with one of the motorcycles that was with us and the maintenance man was very helpful and went out of his way to help us try to fix it. The housekeeping staff and the breakfast room lady were all so friendly. It was a GREAT stay! I would definitely recommend this hotel!! Thanks Everyone at the Zanesville, OH Best Western!! We are so pleased you had a positive stay at our property! We are happy to hear that Cody could help you with your motorcycle troubles. We look forward to your return! Thank you! Excellent hotel clean good service especially front desk girls would visit again. Make a point to stay if in area .Food and gas next door.Shuttle services available and very friendly and knowledgeable. Hats off to all. So happy to have you stay with us and hope you return here for your next stay in the area! Upon check in there was only one person to do the check in and people were waiting because of this. It was a special event and we had over 120 people checking in, had to wait. Waited in line for approximately 10 minutes to check in and the young lady said no so we waited. There should have been more than one person checking in people as we were part of a group of about 140 people staying at this hotel. Directly off the interstate. 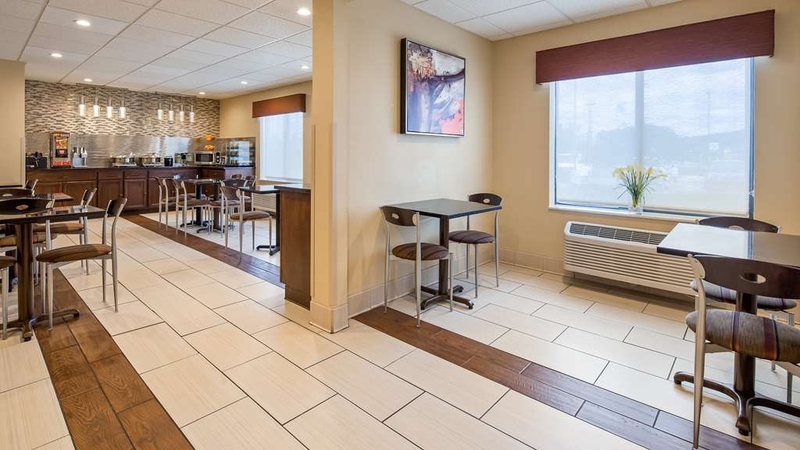 This hotel is clean, comfortable and offers a free hot breakfast. The rooms were good sized and had plenty of clean towels. This hotel is better than many of the Best Westerns I've stayed at. Thank you for your compliments! They really bring joy to myself and the staff! Knowing that we would be arriving late after a long, twelve hour day of driving, we had reservations and were ready to hit the hay upon arrival. The desk clerk was friendly, although check in seemed lengthy. 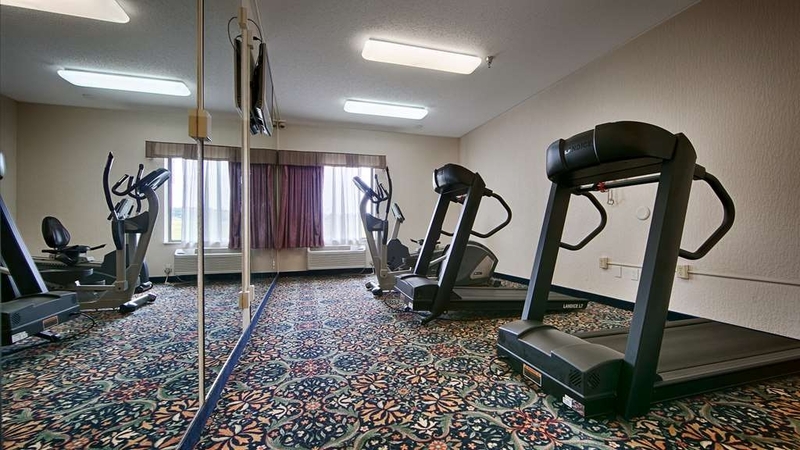 Our room was large, clean, had a good mattress and was adequate for our one night stay, We did not use the indoor pool or fitness room, so can not comment on those amenities. The breakfast was actually quite good: eggs, sausage, cereal, juice, coffee, yogurt, etc. An apple was the only fruit. We were told the menu would include biscuits and gravy, but alas, they were out (?) of biscuits when breakfast was served. Some parking lot noise during the night (we were on the first floor), but other than that, our room was quiet. I would stay in this motel again. Thank you so much for your kind comments and we value all feedback from our guest! "Did these people stay at the same hotel I did ?" 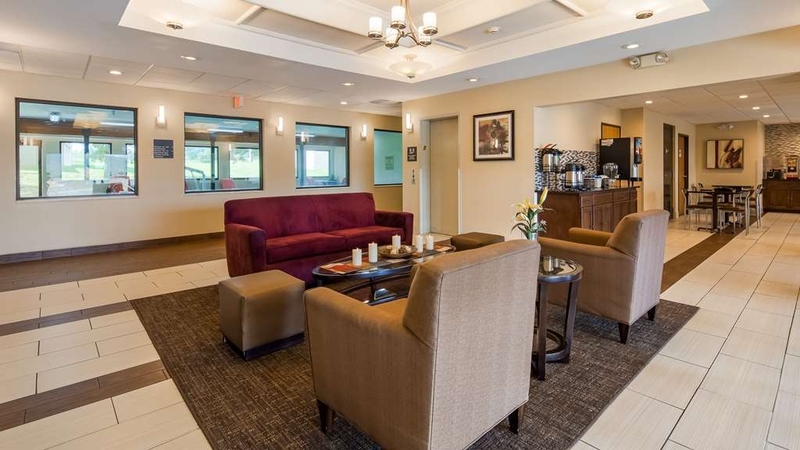 Okay let's start off this review with the positives There is no highway noise The tv is very nice The staff is extremely friendly and helpful There is a microwave and fridge in the room. Negatives The outlets are almost out of the way and spark when you plug a charger in the wall There was NO towels in the pool room There is something brown on the curtain not sure if it was poop or just dirt. There was no TV guide The breakfast was terrible Cereal but NO milk No yogurt No pancakes or waffles They had sausage and eggs Orange juice and some other kinds of juices. I am not sure where these people stayed. Room was comfortable, but it did not have adequate power outlets for a modern traveler. The swimming pool is open late (past 10pm), so is easy to check in late and still enjoy the pool. The breakfast room had an automated pancake maker that made really good pancakes just by pressing a button. Wonderful stay, staff was friendly, breakfast was great with many choices, and the pool was very relaxing. The rooms were perfect and really did not hear any highway noise like I thought I would. I will definitely stay again on my way through. I appreciate you taking time out to give us feedback. We are glad you like the breakfast and pool. Also that it was nice and quiet for you! We hope to see you on a return stay! Wonderful place to stay, my kids enjoyed the pool and front desk went above and beyond to met our needs, very helpful in all aspects. Breakfast has a little bit of everything even toppings for the pancakes and yogurt, was very impressed!!! Rooms were very clean and comfortable, we didn't want to leave!! We will defiantly stay here every year!!!! Thank you so much for your kind words. We hope to see you return again. Room extremely noisy, food poor, cheese omelet tasted like it was made with cheese wiz, juice machine didn't work, pancake machine didn't work, huge pot holes in the drive way. Owners obviously not taking care of the facility. Would not recommend anybody stay here until place is better maintained. 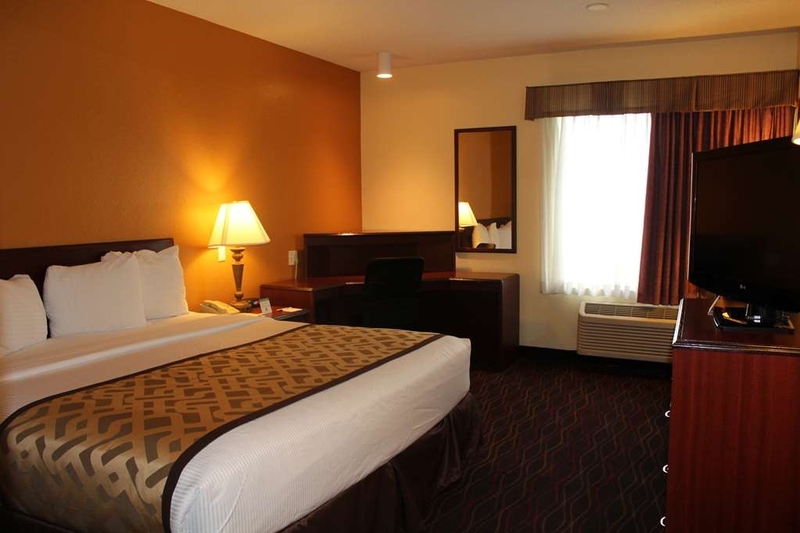 Mr. Barry L: Thank you for taking time to review Best Western B R Guest. I understand that your were not satisfied with your stay specifically breakfast. I have shared your experience with our team as well. Your feedback will help us serve our guests better. 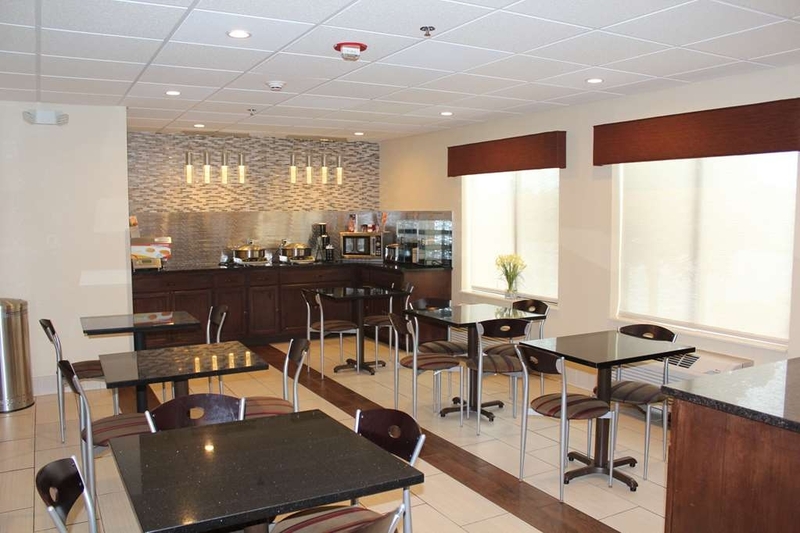 As you may have noted, we have renovated our breakfast area, lobby and corridors. we will continue to upgrade the other areas this summer. I assure you that hotel's owner, entire staff including myself take great pride and enjoy serving each and every guest. We will take a look at our breakfast items and evaluate it. I hope you would give us another chance and stay again with Best Western B R Guest. "Sort of in the middle of nowhere"
The hotel is ideally suited if blasting cross country. Just a short distance from Junction 160 of Interstate 70 (Ohio). This area is shared with several fast food places. I'd normally try and walk but none of these are good "evening meal" stuff. Instead Zanesville is 5 miles due West and there are a few decent places just off J155. Although close to I70 there is no obvious road noise. Breakfast was "the usual" sort of thing; bacon that is so crispy it breaks apart when you touch it so need a spoon to eat it, eggs that have been turned into odd looking flapjacks and sausages with more spice than you could imagine. BUT I'd stay here very happily as the rooms are clean, comfy and quiet. Hi John thanks so much for staying at our property! We are still located in Zanesville, we are just outside the hustle and bustle of the Underwood exit. We unfortunately do not have bacon here, so I do not want to disappoint any other travelers with that. We are looking into making some breakfast changes in addition to the toppings station we recently added. We hope you return to the property and see what other changes we plan to make! Thank you! Angela, Thank you for your kind comments! We hope you stay again with us when you are in the area. We appreciate you taking the time to leave us feedback! We were headed home after a long 10 hour drive. The room was clean and comfortable as it was the last time we stayed here. Our only complaint was that the breakfast was poor by the time we got to breakfast. We were 30 minutes before they closed breakfast and there was little food left and what was left was brick hard (the biscuits). The place was clean, quiet, and that made for a good night's sleep. The excellent Breakfast (which was sausage patties and cheese omlets, this mad for a good morning start. The room was clean, not dated and the bed was very comfortable. 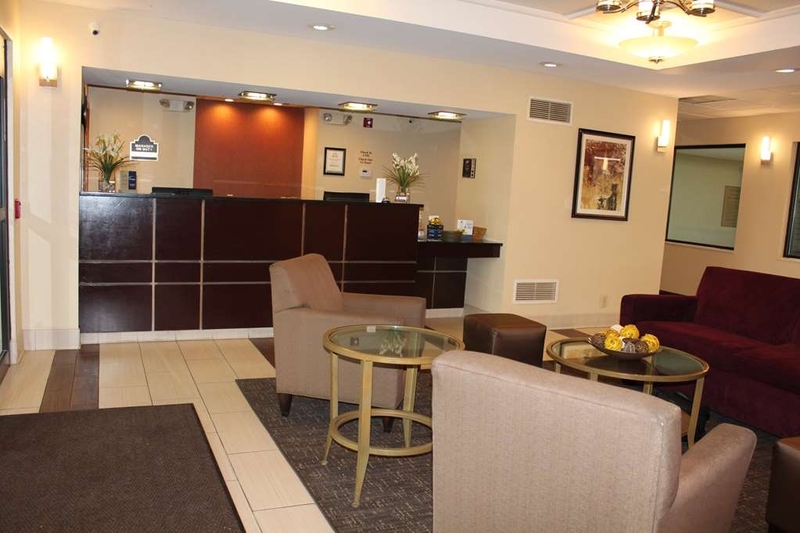 The lobby was clean and uncluttered, and the staff was VERY helpful and courteous. Could not have had a better experience. I stayed at another Zanesville,OH hotel my last trip through Comfort Inn. WAY overpriced! Notice, I did not stay there this time. This place was WAY better. Had my dog with us, and not a problem. Thank you for such kind comments about the property and staff! We strive hard to make everyone's stay as good as yours. We are happy you stayed with us and hope you do so again in the future. 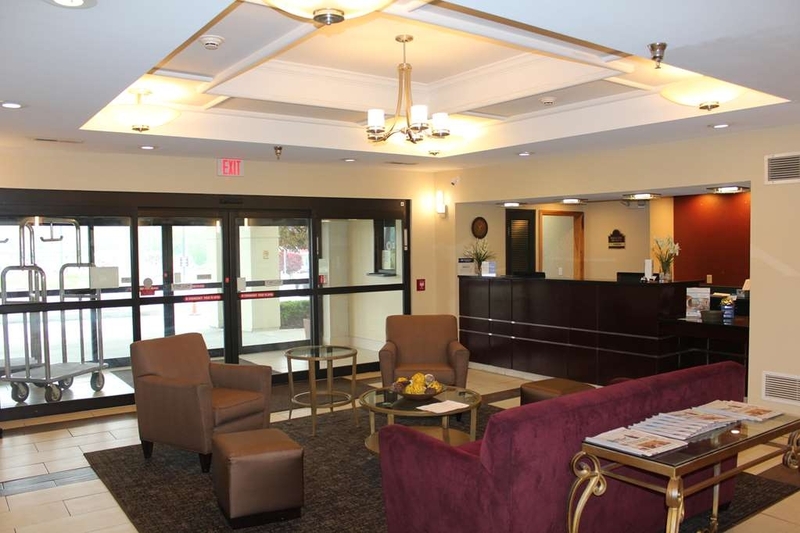 "Decent place to stay overall"
Convenient location , front desk were polite and professional. Room was nice, mattress needs replaced, maybe some better pillows. Side entrance lock mechanism for room key did not work. Was propped open when we arrived but I removed that, didn't feel safe with it open. I am glad our staff was polite and your room was nice. We are in the process of upgrading and renovations so the pillows and mattresses are only a matter of time. I do appreciate you removing the item propping the door, as that is a safety concern. Thank you for staying with us and hope you return if in the area. I must begin by saying I get skeeved out rather easily. That being said, I was very happy with this hotel. I have 2 dogs and was a little worried what the room would be like. It did not smell weird, look dirty, or have dog hair . I was pleasantly surprised. The only downfall is that they put dog owners on the third floor. That isn't the best when they need a potty break. Also, I was afraid we might be disturbing the people downstairs every time my dog jumped of the bed. I would stay at this hotel again. We are happy that you had a pleasant stay! I will take just a moment to explain why we have the pets on the third floor. We offer all rooms types on that specific floor so we felt that would be the best floor to make a pet friendly floor. So glad to see you would return again and hope that you do so! Thank you! "Worst BW I have ever stayed at !" I would recommend that you not stay at this property. It is terrible. Must be a 3rd world Owner. who needs to get out of the hotel industry. The lobby was torn up so you had to check in at a window. The walk around the building to get in. The desk was falling apart. There was no desk lamp and the rest of the room lighting was horrible. The InterNet was terrible. There was no power outlet at the desk. The toilet was plugged up... I had to find a plunger. The room had not been vacuumed. The pillows were all hard. There were only two (2) tables for breakfast. Take my advice and go somewhere else! Dear Steven T, I would like to apologize for your unhappy stay recently. We understand you came during the time of renovations and we are trying to get those done in order to serve you & all other guests better. We apologize for the inconvenience. We hope you return once they are complete and see the finished product. Thank you! Nice hotel, good location for the reason I was there, a Dog Agility Trial. It is inconvenient when staying with dogs(had 2) since you have to stay on the 3rd floor only. I have stayed here many times but last year they started making any one with dogs stay on the 3rd floor, is a pain to have to take the dogs out to relieve themselves. "A Great Place to Stay in Zanesville, Ohio." bring your own pillows. every one was nice. there was a big crowd for breakfast and didn't have enough hot food. the driveway is very much in need of repair. I stayed there with our school on a school discount. 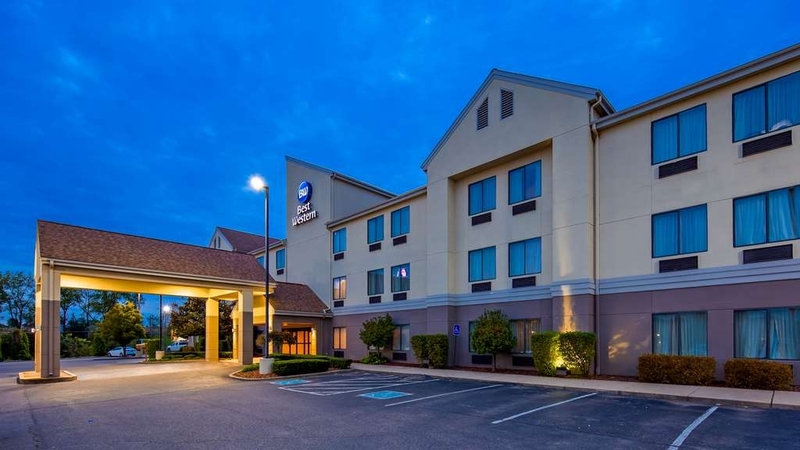 "Typical Best Western, location kind of out of the way"
This was a typical Best Western property with all the amenities: clean fresh rooms, reasonably well kept facilities, pool, hot breakfast etc. When we booked it I booked on price because I was surprised to find all the hotel prices in Zanesville were significantly higher than other destinations on our road trip (Knoxville, Lexington, etc.). I was puzzled as to why. So we booked this one but found out when we got there that it was a considerable distance out of town with only three chain type restaurants around. It suited us for an overnight stop, but is kind of in the middle of nowhere. Hotel is very underated in terms of stars. Rooms are clean and set up well. Staff is friendly and professional. Location is convenient and close to gas and food choices. Breakfast had all sorts of choices and varied from day to day. The pool water was warm and inviting. The driveway needs to be paved at the entrance. They are under going some upgrading construction so hopefully that's on the list. Great place, great price. The hotel staff were very good. They were very helpful and friendly. The hotel is right off freeway 70. Several restaurants within a block of the hotel. Quick and easy access off the freeway. Great place to stay. And I felt safe there. I stay here several times and have felt safe and it is convenient. "Slept good...once we got there." The check in process took quite a while even with prepaying, due to what seemed to be some disorganization with the office as it related to the person in front of me. It was at night and they only had one person at the desk so I had to wait my turn. I wasn't expecting my turn to take quite so long to come around. Once in the room, everything was fine as normal with BW. I stay here on all of my weekly business trips to Zanesville. Rooms are clean, neat, comfortable. The staff is amazingly friendly! They go that extra mile to make your stay enjoyable. 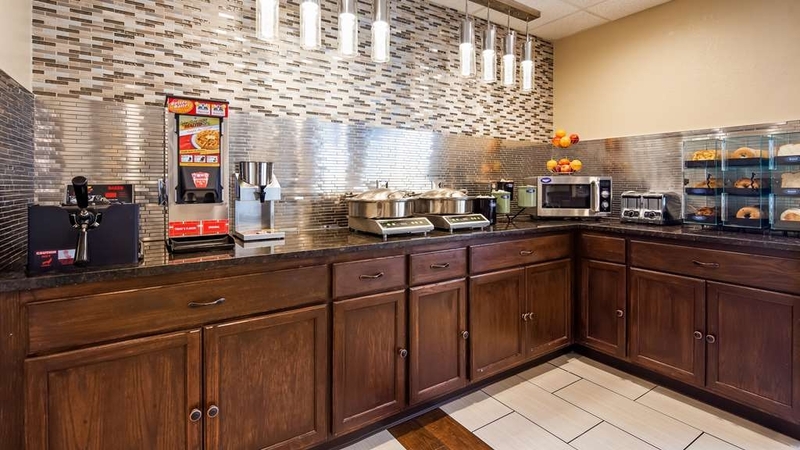 Continental Breakfast has a Variety of hot foods, cold foods and coffee, hot tea, juices, fruits. A great start to your day. "Enjoyable stop at the Best Western in Janesville"
Hotel was very clean. Tub drain worked as if new, breakfast was very good, wi-fi worked very well. Mini refrigerator kept our food fresh. Totally carefree visit. We will plan our next trip to stay there again. In my life, I have stayed in several five-star hotels and resorts. These include the following; the Pierre in New York, the Fairmont in San Francisco, and the Ritz Carlton in Chicago, and the Hana Maui Resort and the Mauna Kea in Hawaii. I site these because of the level of service and environment I enjoyed. The Best Western B R Guest is in every way comparable to these. The staff is professional and friendly. The rooms are impeccable and inviting. The breakfast offers many choices both hot and cold. I have stayed on more than two occasions. During my last stay, I found the weather a bit iffy and decided to stay a second night. I would highly recommend this hotel. The hotel was clean, with clean rooms, nice pool, and breakfast. Hotel staff was friendly and helpful. It is located right near the highway with easy on off access. There are several fast food and gas stations across the street. Room was like new . Staff was friendly . Heater could use a little work , wife thought it was noisy . Parking lot I think was being worked on . Couple of fast food restaurants close by . We had dog with us , no problem . Pool looked nice , didn't use . At the end of the day, when you are bone tired.. It's nice to find a place such as this, with the pool, diner across the street and a jump back on the interstate once you are refreshed and ready to continue, Value wise, this motel is about as good as it gets..
On our way to celebrate the holiday in North Carolina with family needed just one night layover. Room was clean, a little dated but very nice. Staff was friendly and helpful. Not a lot of restaurant choices, went to the Denny's diner for dinner seemed the best choice and found out there was a boil advisory due to a water main break. Went back to the hotel and asked the front desk if they heard about the boil advisory (Brushing teeth would be unsafe to say the least .... Ice machines, drinking from fountains, etc....we bought a few bottles of water at the convenience store across the street to take meds) no one at the hotel knew about it and they said they would contact management. Went to our room, Beds were comfy, some noise early evening, refer truck in parking lot but slept surprisingly well. In the morning my husband went down to get a few cups of coffee but asked about the boil alert, told him we found our last night at the restaurant....someone on staff immediately called the restaurant and was told boil advisory was in Effect til 3 pm!! A frenzie ensued and coffee, juices, etc were pulled from the breakfast bar. Needless to say we went elsewhere for breakfast so can't review that. I believe it could have been handled better and we totally understand an emergency situation, but guests should have been notified of this in a timely manner. We stayed the Sunday night after Thanksgiving. The room was exceptionally clean and comfortable. The breakfast was good. It was quiet through the night. It seemed like it was a good value. Wouldn't hesitate to stay again. "Very nice staff and clean room." 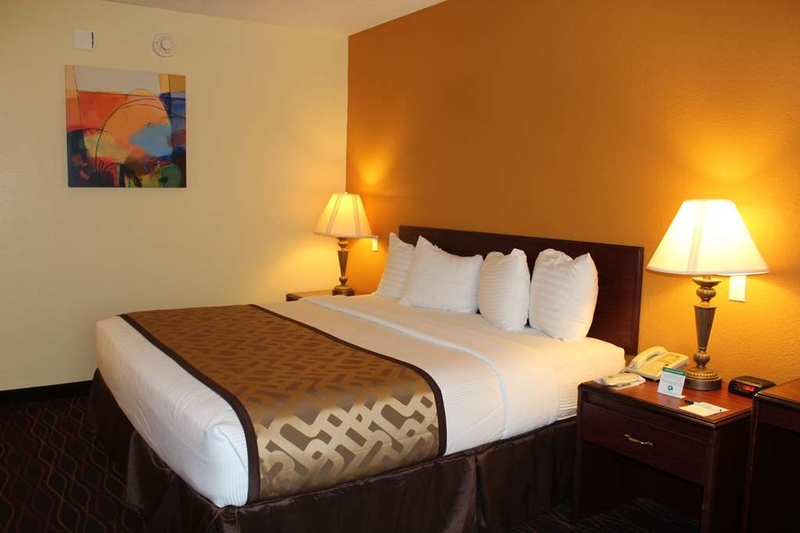 The staff was very accommodating and the room was clean and well appointed. Breakfast was biscuits and sausage gravy, eggs, cearal, yogurt, and bagels/toast. Just what we were looking for in a quick over nite stay. Very nice room. Breakfast quite good. Good value. room was clean and comfortable. Internet worked fine. I'd stay here again. Only problem is there isn't much choice for dinner unless you want to get back in the car and drive 10 miles. The room and hotel were clean. The staff was helpful and very nice. The mattress we had was lumpy and needs to be replaced. We shared that message with the clerk at check out. We were told they were in the process of replacing them. We'll find out next time. We didn't try the breakfast but we will try that as well the next time we stay here. Perfect, very clean!!! All employees were very friendly and helpful. Will stay again, breakfast was wonderful!! Pool was warm and room was perfect. Should be a five star hotel!!! Was amazed at how friendly everyone was, front desk is very professional and helped with everything needed. I had asked for a roll-in cot. It did not fit the room. So had to sleep with husband in same bed with a noisey CPAP machine. No sleep for me. Breakfast was poor. The pancake machine is only used every other day. So no pancakes for us. The day time manager was very disinterested in my compliants. She was too busy with friends who had brought in meals and were eating in the dining room ready to watch a game on the big TVs. The night time manager had put on the sign out sheet that I had insulin in their frig., she was too busy getting back to her friends to look at sheet. So my insulin got left forgotten best I was too upset with her attitude. I had asked for a frig and microwave in our room, did not get it, they don't have them in handicap rooms. If they should provide them it should be for handicapped people. Had a poor experience at two other Best Westerns. They will never get our business again. There was no offer to reduce our cost at another stay or reduce this stay. Other hotels try and occommodate patrons this manager went out of her way to show she was not interested at all. The rooms were clean and everything worked well. Most of the staff were very helpful and accommodating. The pool appeared clean although I never used it. I saw several people use it and they seemed very satisfied. The motel had ample parking and a good breakfast. I did have an issue on two consecutive occasions where I did not receive a wakeup call that was requested. I complained after the second time and there were no further occurrences. So, I guess the issue was handled and the employee who neglected to put in my wakeup call was dealt with. I was on a hunting trip and did not utilize room service so I can not tell you how well they do if you stay multiple nights. The room was in very good shape when I checked into the motel and I observed the staff cleaning the other rooms and they were working very hard. Overall, I was pleased with the rooms condition and most of my dealings with the staff at the motel. I stayed 10 days at the motel while on a hunting trip and had very few issues and most of the staff were very helpful . I am required to type 200 characters and I am not very good at typing so I hope I have enough. "I have yet to stay at a Best Western that I was not satisfied." We used a coupon from the Visitors Center for this room so it was under $100 (not much) and it was very comfortable. We were on our way to Hershey, PA. There are restaurants right next door and nice area of town close by to visit. (By the water) Hotel was comfortable and full breakfast was included. I would stay here again. Helpful and welcoming.....feels like I am home after a 6 hour drive! Have been driving back and forth to the DC area to help family, and the location is half way. The staff now knows me by name ....check in and out is a breeze! Breakfast is great, the area has all things that I need- gas, lots of choices for dinner, option of driving for a while on the National Road as alternate I-70! We go to this motel two or three times a year when they have a dog show in the area. We are always pleased with our stay. Very nice motel with nice rooms, good location close to highway and places to eat. We stayed in many motels in Zanesville and this is the best. Our last stay we got a room that was a little noisy. Teresa was very understanding and got us another room the next night with no charge for the first night. Both Teresa and Rosie Wheeler, the general manager, are very accommodating. And they have a great breakfast. The staff at this hotel was amazing!! Had a few issues w/the cleanliness of our room, but didn't want to have to switch rooms because we were traveling with a small child and it was just too much. All we wanted to do was rest before letting our boy swim the evening away. We were traveling home from Iowa to Virginia. Good overnight hotel to stay at right off !-70 east. Room was very clean as was the entire hotel. Although it is a non-smoking facility the hallways reeked of tobacco. Front desk staff very friendly and professional.Appeared that this hotel is a popular stop for over the road truckers. 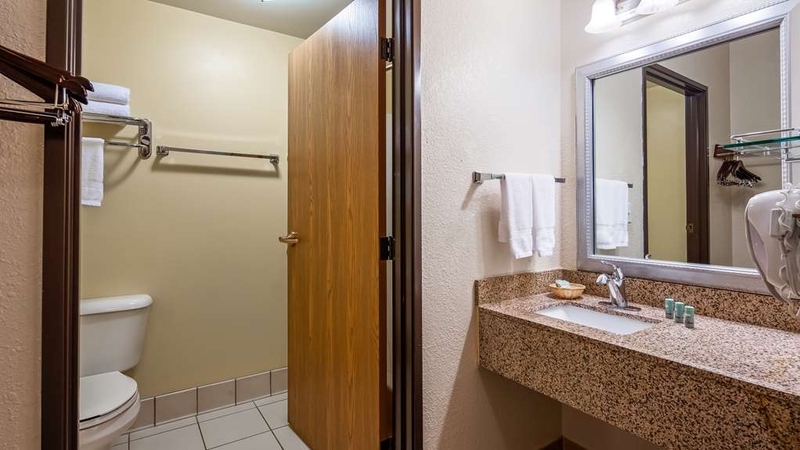 My wife and I only use Best Western because the rooms are ALWAYS Clean. My wife has to do her PED ( kidney treatments) every night so the clean and roomy rooms are a must. The rooms are pretty fair, then there is the AARP discount which really makes it nice. I like the breakfast to wake up too just the way to start a day. We stay at this motel at least twice a year. We do two events at this motel and have been doing so for 13 years now. We have seen lots of changes over those years. The rooms have all been redone over the last couple of years. The rooms are very nice and clean. The staff is very friendly. The breakfast is good. It is a good value for the money. Very friendly helpful staff and great hot food and nice comfortable rooms. Arrived late. If we arrived a little bit earlier would have use the pool and fitness room. Best sleep in a long time. No dog to keep me awake! "Right on the edge of being a great place to stay." We drove up and got a room. Leeann, the desk clerk was more than helpful about getting us settled and answering any questions as well as finding the right rate. Upon going to the room on the third floor the odor of smoke in the third floor hall was very obnoxious. I ask Leeann about it and was informed that the house still has smoking rooms. I gave up smoking and now I know how I must have offended everyone who did not smoke. The breakfast room was not what was advertised. The sausage was languishing in a pool of grease and it tasted just like that, grease. The eggs were gone and when we ask about them the cook said, the are not more until we get a delivery, we ran out. My wife ask about cream cheese for the bagel, we ran out of that too. There was one of those pancake machines that you push a button and it makes something that looks like a pancake but that is where it ended unless you like tough stuff. I cannot have milk, so no cereal. I had toast, jam and orange juice and some greasy sausage. The did have hot sauce which helped the sausage immensely. Had time permitted we would have gone out for breakfast, we thought that about an hour before it ended was enough time and packed first. I wanted to say that this is a truly fantastic place but the smoking and the breakfast shot that to pieces. "An Excellent Place to Stay!" We've stayed in the B.R. Guest Best Western in Zanesville, OH, many times and have always been extremely satisfied with every aspect of the hotel. 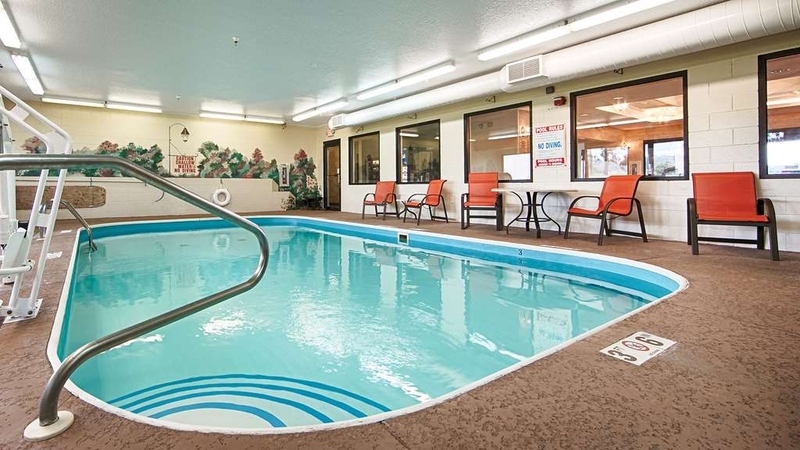 Its extremely clean rooms are inviting, and its indoor pool is open late, which is especially nice if arriving later with children and/or grandchildren who want to swim before bedtime. (And the beds are awesomely comfortable!!!) We also love the fact that it's a pet friendly hotel, since we travel with our dog. "WEEKEND IN "THE WILDS" OF ZANESVILLE"
This was an excellent place to stay if you are visiting the Zanesville area or visiting "The Wilds". Close to town, easy access, and reasonably priced. The drive to the Wilds is easy from this location but there is only one gas station on the way, Mother Tucker's. Be sure you fill up before the drive. When in this area, call and see if you can visit the Alpaca Farm. The hotel is lovely, and kind of a hidden gem off the highway. Great staff, particular Meredith, who was simply awesome. She recommended food, gave us numbers for great places that delivered, and couldn't have been nicer or made us feel more at ease after 12 hours in a car driving. The hotel is clean, comfortable and has nice amenities Highly recommended.